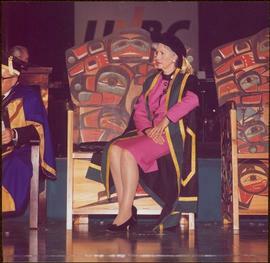 Photograph taken at Chancellor's Farewell Appreciation Celebration held at the University of Northern British Columbia in Prince George, B.C. ; see also items 2009.6.1.582 - 2009.6.1.590. 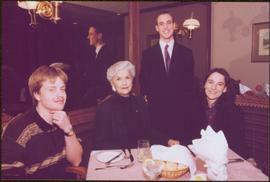 CD-Rom is an "interactive presentation" created by Hobsons Digital Media for UNBC for promotional purposes. Disk contains promotional video (1994.1.1.5.5.03), brochures, and images. 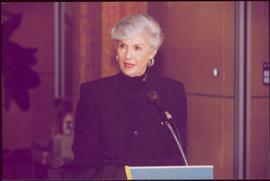 Photograph taken at Chancellor's Farewell Appreciation Celebration held in Prince George, B.C. ; see also items 2009.6.1.582 - 2009.6.1.589. 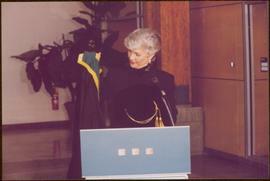 Photograph taken at Chancellor's Farewell Appreciation Celebration held at the University of Northern British Columbia in Prince George, B.C. ; see also items 2009.6.1.583 - 2009.6.1.590. Campagnolo holds red roses. 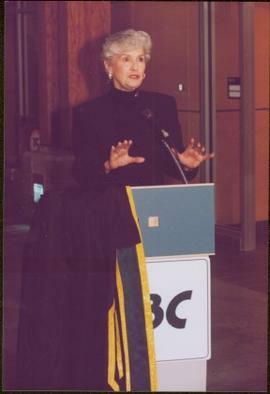 Photograph taken at Chancellor's Farewell Appreciation Celebration held at the University of Northern British Columbia in Prince George, B.C. ; see also items 2009.6.1.582 - 2009.6.1.590. Chancellor’s regalia is draped over podium. 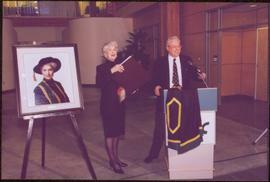 Photograph taken at Chancellor's Farewell Appreciation Celebration held at the University of Northern British Columbia in Prince George, B.C. ; see also items 2009.6.1.582 - 2009.6.1.590. Stamped annotation on verso reads: "MAY 1994". 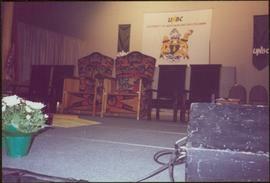 Photograph taken at the University of Northern British Columbia in Prince George, B.C. Campagnolo and Weller wear full regalia, and RCMP officers can be seen in crowd. 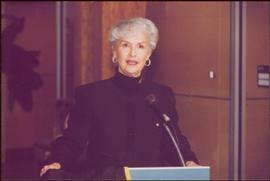 Photograph taken in the Geoffrey R. Weller Library at the University of Northern British Columbia in Prince George, B.C. 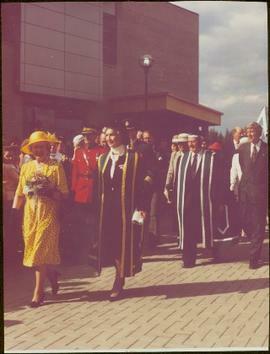 Officer in uniform stands in background.Handwritten annotation on verso reads: “Aug 17 - 1994, Opening Day, UNBC, Library". 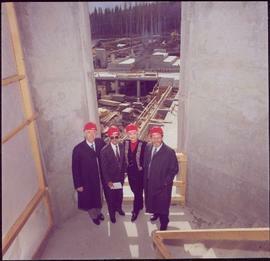 Left to right: Interior University Society President Murray Sadler, Prince George Mayor John Backhouse, Chancellor Iona Campagnolo, and President Geoffrey R. Weller.Handwritten annotation on verso reads: “Construction of UNBC”. UNBC Publication "The Grape Line"
File consists of 1 audiocassette of interviews by Bob Harkins with John Backhouse, city librarian discussion of referendum on construction of new library. Also contains interview with Don Thatcher, conservation officer. 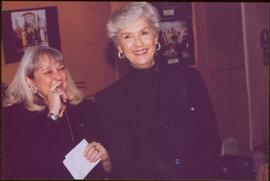 Item consists of transcript of interviews with guests on the Simon Break radio show including members of the musical group The Rhythm Pals and librarian Anne Allgaier. Item consists of transcript and tape summary of interview with Fanny Kinney who discusses her family and her career as a pioneer school teacher in South Fort George. Item consists of transcript of interview with Bob Dunsmore, CNC Forestry Dean who discusses forestry and agriculture education at College of New Caledonia. Item consists of transcript of interview with Prince George Librarian John Backhouse regarding the referendum for the proposed construction of a new city library. 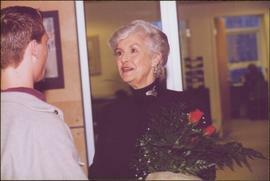 Item consists of transcript of interview with poet, former CNC faculty member Barry McKinnon conducted by Bob Harkins at Prince George Radio Station, CJCI regarding McKinnon's teaching and publishing careers. 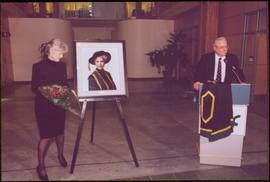 Series contains textual material and publications related to UNBC's history. 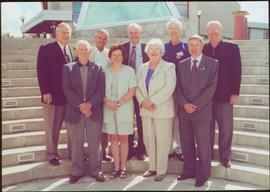 File consists of the UNBC Aboriginal Services Plan from 2007. 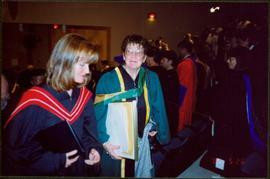 File consists of a UNBC Financial Statement. File consists of a Discussion Paper between Prince George Native Learning Centre and the UNBC Adult Education for First Peoples. 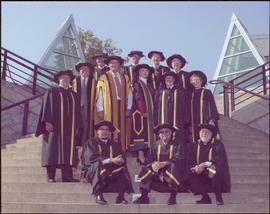 File consists of a UNBC Office of Institutional Research Contacts Directory. 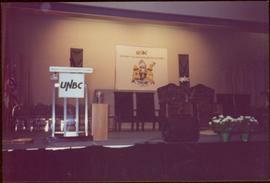 File consists of UNBC phone directories.